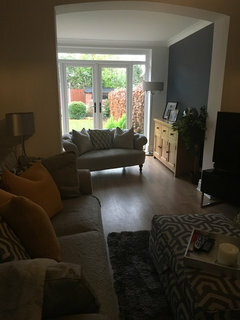 living room decorating Help !! We getting room decorated next week, and we really don’t know what to get done. We have changed sofas to mid grey cloth and changing the smaller sofa with a snuggler. 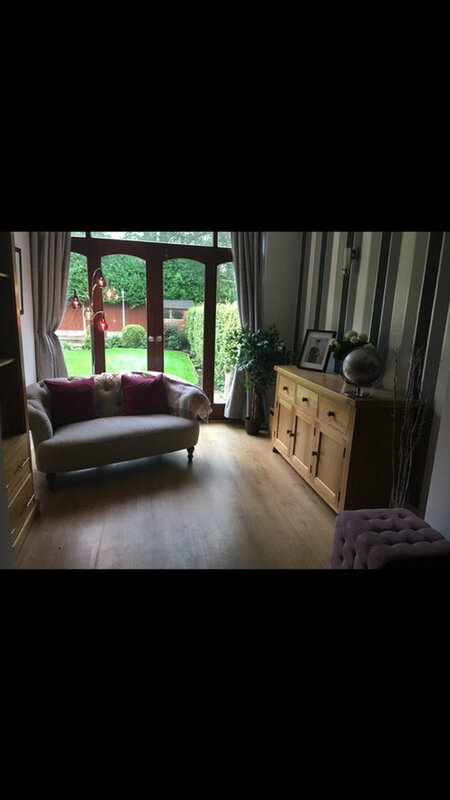 Large footstool instead of coffee table . Getting rid of wall lights and having central ceiling lights fitted . Not chosen lights yet. It’s quite a dark room with only natural light coming from french doors. Thinking of another matching side table next to large sofa and lamps. Not chosen yet. 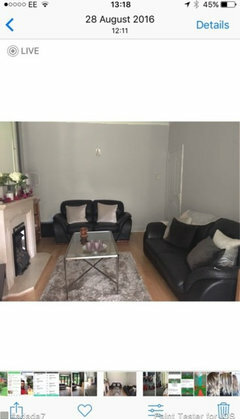 Please help what colour paint , will we have one colour all over or have different shade in alcoves/ chimney breast? 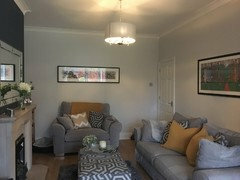 For lighting we have a central ceiling light in both areas, a large table lamp on the left hand side of the sideboard, another table lamp on a small table on the right of the large sofa, and two wall lights on the wall where you have one. IWhen we relax there we like a low mellow light, so. rarely put the ceiling lights on. We painted it grey shortly after we moved in and haven't done a lot to it, apart from sanding and sealing the parquet floor. I am really interested in what you do so keep us posted! Thank you Kathy for your input It’s really helpful hearing what others do. Not thought about putting lamp on sideboard so that may be an idea. We getting rid of wall lights we never use them and have found we can’t put any pictures on wall as they in way. We looking at pics with dark blue on fireplace wall but worry it be dark. Thank you yes, it is the room! I bought a tester pot of the F&amp;B Strong White, but when tested it looked cream. I also bought the F&amp;B Anthrocite which was a bit darker. Will try the Bone White also. Love the cushions in the pic - navy with the piping. 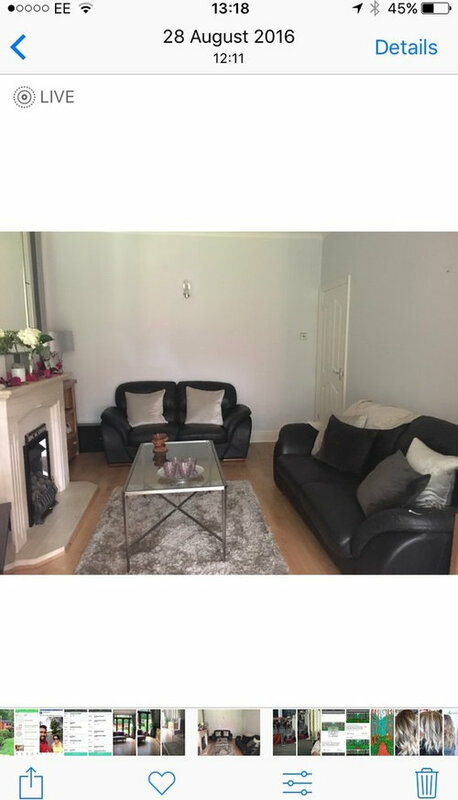 Would also maybe like to go a bit darker on the back wall as in the pic but wondered if this might be too cold in a north facing room. I know that when the colours dry they appear darker and also in a larger space than just a test area, so may well try something along the lines of the Anthrocite. 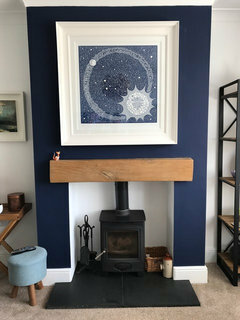 I love the dark blue on my fireplace wall, go for it! Love the dark blue Mandy , do you know what colour it is ? Got Stiffkey Farrow & Ball for chimney breast with a white grey for rest of room. Do I leave alcoves in pale colour and then furthest wall in Stiffkey or do alcoves leave the rest ? Decorators are in today got to make decision. Large mirror going on chimney breast. 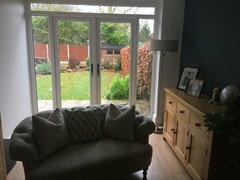 French doors now replaced with new white ones. Might be a bit late but here’s a couple of mock ups with the back wall in blue or grey. 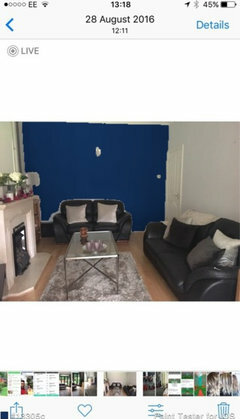 Personally I would have the chimney breast and back wall in blue with the rest white/grey. 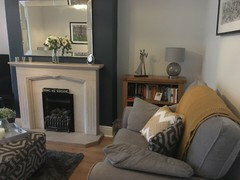 Just thinking if the colour is in the alcoves or just on the chimney breast it would be mostly obscured by mirror and other things and you wouldn’t be able to admire it. Some nice artwork on the back wall would also look good. That’s what I would go for anyway but it’s down to personal choice. Thank you for input ,it’s not too late decorator painted ceiling today. Didn’t think of doing back wall I was thinking the wall to left of tv. Love the mock up really gives good impression. Try more than one source of light. The room needs a couple of desk lamps and a floor lamp. Ceiling lights on their own can be very harsh. 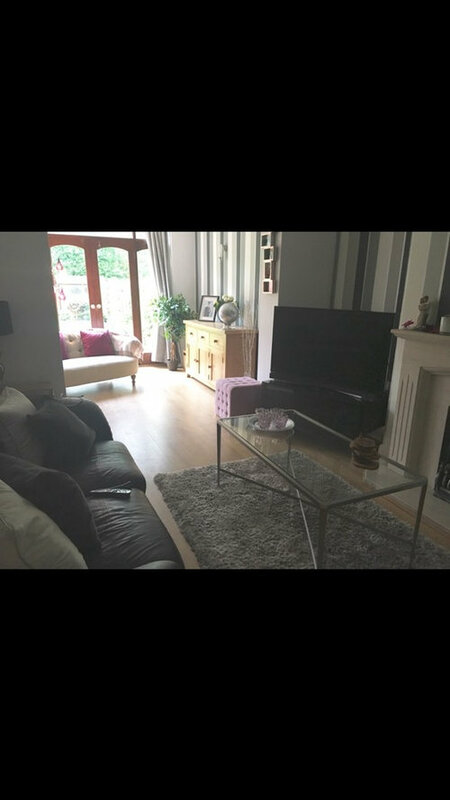 Thank you , we have a lamp on side table next to sofa thinking of getting another side table other side of sofa and having matching lamps. On small bookcase in alcove have another lamp. Do you think that will be ok ? That looks superb! So much better than it began, well done. Thank you molly20100, the art piece is Jackson Pollock “summertime “ it was from John Lewis . What a lovely transformation! - the room looks so welcoming and stylish. This is a great site for help and advice isnt it?